Windows 8.1’s sharing goes way beyond the old cut and paste. In older versions of Windows, and the desktop of the current version of Windows, you can copy the web address of a site and paste it into, say, an e-mail message. The pasted address is just text, something that starts with http://. Depending on which e-mail program you use, the address may appear with an underline signifying it’s hot (clickable). When someone receives your e-mail, he can see the link and, if he’s curious, click it and have Outlook (or Gmail or Metro Mail or Outlook.com or Yahoo! Mail or whatever) automatically bring up the default web browser and go to the location mentioned in the hot link. The Windows 8.1 Mail app also has a contract that says, in effect, “Win8.1 Mail can accept a hot link, a picture, and some text.” Of course, Mail can accept all kinds of things. One of the contracts it supports is this one, which is designed specifically to accept shared data from a web browser. 1Fire up the tiled version of Internet Explorer. 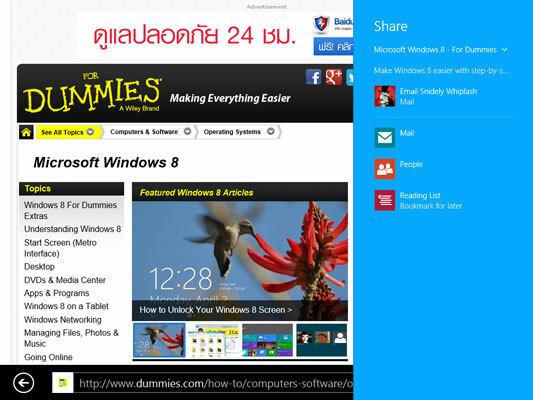 Sharing only works on the tiled side — the desktop version of Internet Explorer can’t share. 2Navigate to a web page that you want to e-mail to a friend. Bring up the Charms bar by swiping from the right, hovering your mouse in the upper-right corner of the screen, or holding down the Windows key and pressing C.
3Tap or click the Share Charm. Windows looks through the list of apps that can accept shared stuff, and zeroes in on apps that can handle the kind of contract that Internet Explorer can provide. Mail just happens to be one of those apps. Windows starts Mail, creates a new message, and copies the information — using the contract — from the browser into the message. 5Fill in the addressee, type in any additional information you like, and tap or click the Send icon in the upper right. The message that gets sent out looks like what you see here. In the old-fashioned method, you have to do all of the copying and heavy lifting, and the result isn’t anything to write home about. But sharing with tiled apps, there’s a very significant amount of data that’s sent for you — and you don’t need to lift more than a finger or two.